GIGABYTE has added its first Intel Apollo Lake-based desktop motherboard to its product list. The platform is designed primarily for low-power entry-level PCs, but the manufacturer decided to tailor its J3455N-D3H also for customers who need various legacy I/O technologies, indicating that this board was perhaps orignally designed for a specific customer but is now being released to the wider public. The mainboard is equipped with a host of older interfaces, including COM, LPT, PS/2, D-Sub and PCI. Just like the name suggests, the GIGABYTE GA-J3455N-D3H is based on the the Intel Celeron J3455 processor (four Goldmont cores clocked at 1.5/2.3 GHz, 2 MB cache, dual-channel DRAM controller, HD Graphics 500, 10W TDP) that feature Intel’s ninth-generation graphics architecture (Gen9) as well as a refined media playback engine with hardware-accelerated playback of 4K video encoded using HEVC and VP9 codecs. 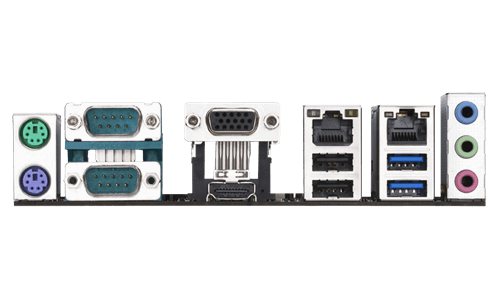 The Mini-ITX motherboard is equipped with two DDR3L SO-DIMM slots (supporting up to 16 GB of DDR3L-1866), two Realtek GbE controllers, four SATA connectors (two controlled by the ASMedia ASM1061), one HDMI 1.4 output (up to 3840×2160 at 30 Hz), a connector for a TPM module, USB 3.0 headers (additional USB 2.0 ports are supported using the internal header and a Genesys Logic USB 2.0 hub) and so on. In addition to the aforementioned regular I/O capabilities of a modern PC, the GIGABYTE GA-J3455N-D3H also features a number of legacy interfaces. The latter includes two COM ports, an LPT port header, PS/2 connectors for keyboard and mouse, a D-Sub output for displays, as well as a PCI slot for various add-on cards (and such cards may carry additional legacy interfaces, such as PATA, etc.). While the presence of the connectors makes the motherboard a viable candidate for a system running legacy applications, it should be noted that Intel’s Apollo Lake is not supported by Windows 7, 8, Vista or XP. Windows 10 does support legacy hardware, including COM, PCI and other interfaces, but the problem is those old software applications that use COM ports or PCI cards might not work in Windows 10, or require VMs and abstraction to do so. Therefore, to use them, one will need to install Windows 7 or XP on a virtual machine, which is not always convenient. Failing this, a Linux distribution might be a preferred option. 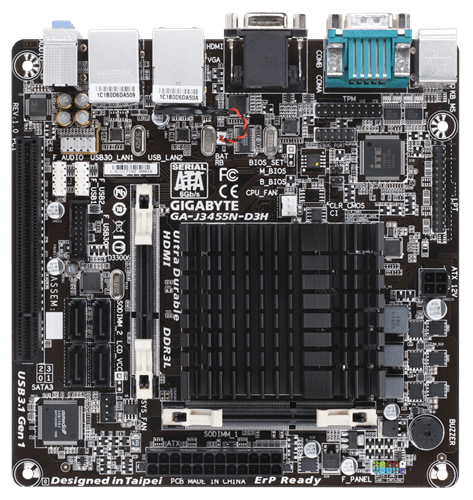 While the GA-J3455N-D3H motherboard is heading to retail, the presence of two GbE ports indicates that GIGABYTE either plans to offer the platform to corporate customers, or is already shipping it to interested parties. If the latter is the case, it looks like GIGABYTE has clients who need more or less modern low-cost PCs with legacy interfaces in their corporate networks. It's always easier to replace a $500 PC connected to a $500k machine than to replace the machine, after all. 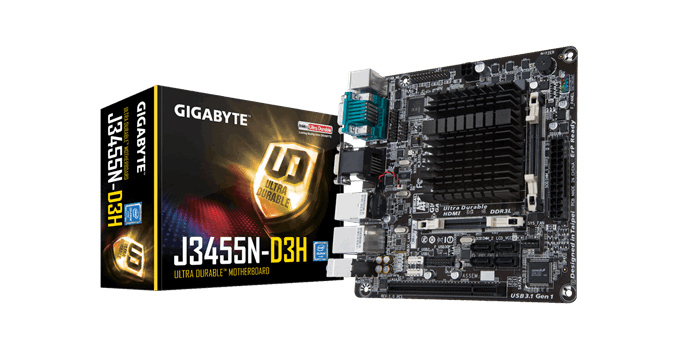 GIGABYTE has not announced MSRP of its J3455N-D3H motherboard or its actual release date. Keeping in mind that the COM, PS/2 and LPT controller, the additional SATA controller as well as a PCIe-to-PCI bridge all cost money, we expect GIGABYTE’s Apollo Lake-based platform to cost more than the base Apollo Lake solutions available.